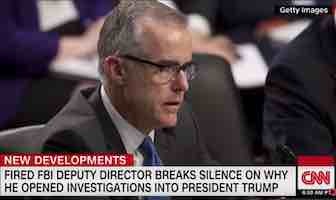 In a move that veritably boggles the mind, fired FBI’er Andrew McCabe has admitted his role in the—mercifully—ineffective coup against President Trump and his administration…aka government. In an interview scheduled to air on next Sunday’s “60 Minutes,” McCabe detailed his and his FBI co-conspirators parts in the planned, plotted and implemented attempted coup against legally-elected President Trump—using a fake Russian dossier. Mueller’s and Rosenstein’s parts in the scheme were for Rosenstein to appoint former FBI Director Mueller to the position of Special Counsel to investigate Trump. This position requires that a crime be listed before the investigation may go forth. There was never—and still isn’t—any crime listed. As I’ve written in several columns, this investigation was illegal from its inception. Still…no one in the government has made any attempt to stop it! That, coupled with the fact that the now-infamous “dossier” against Trump was made up out of whole cloth and that Russian Agents were hired by the Hillary Clinton campaign to write it should—at the very least—cause the arrests of the perpetrators via US Marshall’s office.